The UGTT’s reemerging activism signals a growing emphasis in Tunisian politics on economic priorities. Although Tunisia’s leadership appears to be warming to Saudi Arabia at a critical moment for the kingdom, Riyadh cannot rely on its allegiance. The dissolution of Tunisia’s ruling coalition marks an opportunity for politics to shift away from formal consensus toward party competition and the renewal of constructive debate. Building more community networks to combat violent extremism may help Tunisian authorities develop a holistic, long-term strategy to rehabilitate returning fighters. Tunisia’s parliamentary committees overseeing security and defense are not tackling urgently needed reforms to the sector, largely due to members’ lack of expertise. While most residents of Tunis support a woman as mayor, a sizable minority does not, which may present obstacles for the newly elected Souad Abderrahim. 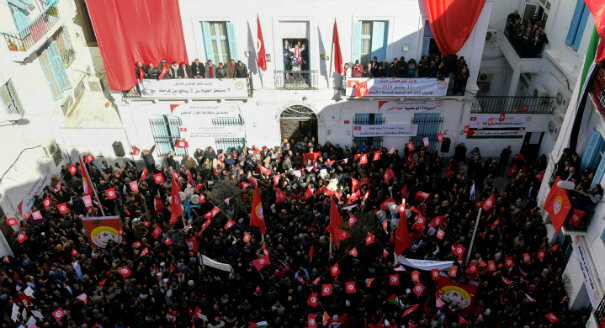 Four experts examine the implications Tunisia’s first free and fair local elections may have for political parties, security forces, decentralization, and the democratic transition. Egypt’s efforts at subsidy reform provide suggestions for Tunisia and Sudan, both witnessing protests stemming in part from increased prices of staple goods. The continued poor performance of the Tunisian economy and the popular discontent might undermine grassroots trust in democracy across the region. Tunisia’s cabinet reshuffle, Administrative Reconciliation Law, and election postponement are prompting fears of a return of the Ben Ali regime. Attempting to appease both Tunisia’s international lenders and its domestic socioeconomic movements has eroded the government’s political capital. How effective have Youssef Chahed’s policies been at addressing Tunisia’s underlying issues? Despite widespread praise for Youssef Chahed’s anti-corruption efforts, they also risk inflaming elite tensions and undermining Tunisia’s democratic transition. Without a new decentralizing framework, elections for new local councils in Tunisia will not make them more responsive to local concerns. One year before its mandate expires, Tunisia’s Truth and Dignity Commission is struggling to complete its work within a volatile domestic political climate. Granting Tunisian security forces suffrage provides police unions greater leverage over politicians, diminishing prospects for security sector reform. Tensions persist between Tunisia and its former ally the UAE, but Tunisia hopes renewed ties could balance out its current dependence on Qatar.